I funded this project on Kickstarter, and I was very excited that it succeeded. The result is a lovely book with an amazingly rich diversity of styles and stories. All artists work with the same three colors - black, white, and red -, and this ties the chapters together visually, even though each one opens up a new world to fall in love with. The stories include a variety of genres; some are fantasy, some are sci-fi, some are dystopian, some are all or neither. Some chapters were tiny, self-contained stories, while others worked as pilots or teasers for a larger world and a longer adventure. The latter left me wanting to read more every time ("but what happened next?!?!"). I hope that the artists will continue them, I would love to read each and every one.This anthology is a portfolio, showcasing amazing creators and dreamers of color, and the many worlds and many characters that they can summon out of fire. We need more volumes like this. I backed this on Kickstarter and am very pleased, not just with the stories but with the thorough aesthetic of the volume. Some used a lot of the fire-red, some just touches, but it worked for all of them and tied them together along with the theme. I just wish the stories were longer! Most could spin out nicely into their own volumes. My favorites were Metta Helmet and Breath Plucked From Heaven, and there were none at all that I disliked. Elements: Fire is the second comic anthology from Beyond Press. I backed both this book and the first, Beyond, on Kickstarter, and while I enjoyed both I do think Elements: Fire is quite a bit stronger than its predecessor. Beyond is a collection of queer sci-fi and fantasy stories, putting its focus on telling diverse stories; Elements: Fire is a collection of comics by creators of color who were asked to write speculative fiction themed around fire, with a primary focus on diverse creators. The looser theme for Elements: Fire means the stories in this collection felt like they covered a wider range of topics than the stories in Beyond did, and I think that worked to its advantage. One of my main complaints about Beyond is that many of the stories felt like they were given enough pages to tell quite a bit of story, but not enough pages to tell the whole story, so that the worlds I was dropped into didn't always entirely make sense to me. I had that same issue with a few stories in Elements: Fire, but not nearly so often, and I think that's at least partially because the looser focus on "speculative fiction" rather than science fiction meant the worlds we encounter in Elements: Fire are often worlds that feel more familiar so that the stories don't need to spend as much time on world-building.I really like the decision in Elements: Fire to print the pages in black, white, and red. Some of the stories were saturated in red; others incorporated just the tiniest hints of spot color in otherwise black and white comics. Even though the creators approached their use of red in many different ways, the three-color printing helps unify all the different stories and art styles and is a pretty clever way to make an anthology feel like a unified whole.I think the biggest standout in this collection for me was "Metta Helmet," a dialogue-free story about a woman who takes daily trips into a dystopian city, with a central theme that is written on the wall of a building toward the end of the story: "Kindness is a weapon, use it fiercely." I also really liked "Firelily," about a teenage girl who's trying so hard to make friends that she almost overlooks a classmate who cares about her deeply; and "A Burner of Sins," about a woman whose job is to free people from their guilt as long as they regret what they did, but after encountering a former classmate who is trans, comes to the realization that sometimes people want peace from guilt over things they can't and shouldn't regret. One of the most intriguing stories for me was "Thrustfall," about a boy with a jetpack taking his Flying 101 exam; it felt like a single scene from a much longer story that I'd very much like to read.Most of this collection felt like it was written for teens or adults, but there were also a couple of stories that felt more like children's or all-ages comics that also stood out for me: "Too Hot to Be Cool," about friendship and the challenges of meeting people when you're the daughter of a witch; and "Home Is Where the Hearth Is," about choosing your own family when your birth family doesn't give you the love and compassion you need. Excellent collection of short comics by creators of color. Stotts does an incredible job at editing the anthology from story and art choices to how the book's laid out and organized.Each story is fire-themed, and all the art is black and white with red used as a pop fire color. The stories range from fantastical and magical to futuristic and technological. There are stories about first love, ending war, school, parents, best friends, kindness, weather, and eating the last doughnut from the office kitchen.Disclaimer: I did back this book on Kickstarter. 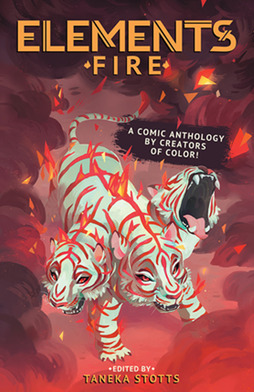 Elements: Fire is a unique and beautiful anthology by queer creators and creators of color. This makes each story, fire-themed of course, special in its own right. Every story is different and has a new perspective to offer. You never know what kind of story you're going to get. It's a stunning collection of works by dedicated artists that clearly care about their stories. Elements: Fire is a must read. Enjoyed the ebook and the softcover editions I got from Kickstarter! Some brilliant artists and storytellers in this book looking at different cultures and centering around the theme of fiery elements. I can't even say which one I enjoyed most as each was engaging. Though I will say "under the Flamboyan" and "Burner of Sins" both feel like they could be expanded into a longer, ongoing series. Hoping for more "Elemental volumes" to pop up in the future! I read this collection last night, while neo-Nazis marched in Charlottesville. Today, with the news of the death and injuries of counter-protesters, this anthology seems even more important. One story that really stood out to me, among vignettes of sorrow and delight, was "Metta Helmet," by Deshan Tennekoon and Isuri Merenchi Hewage. Its shining message, picked out in red from the blacks and grays of Hewage's art, both raises and burdens me: "KINDNESS IS A WEAPON. USE IT FIERCELY." Beautiful, unique, and much-needed collection of works by queer creators, and creators of color. The thread that held everything together - fire, feels particularly necessary in our current sociopolitical climate. The distinct illustrative and storytelling styles came together beautifully thanks to the brilliant use of color. I laughed, I teared up, and I put the anthology down wanting more. So this was beautiful. the black white and red used for each of the comics tied them beautifully together. Even though they all had a theme of fire they were all different and awesome. My only gripe was only a handful of the stories actually came to a conclusion. The majority of them were teasers for much bigger stories. I hope I can back another one of these soon. You will find some of the next generation of comics makers and just some beautiful stories by POC. Thank you, thank you for this wonderful anthology! From funny and whimsical to high-stakes intergalactic stories, you'll find some beauties in here. I love the comic book styling! This has many stories and styles of writing. They are well written and the art is awesome! Just wish there were a few more stories to read! I'll definitely have to check out other books/comics by Taneka Stotts and crew! Absolutely stunning anthology full of passion, pain, and choices. I loved every minute of it. One of the most beautiful collections of stories I've ever seen. Beyond Press has outdone themselves again. A great anthology full of great stories ranging from funny to heartfelt. The art was great for all of them as well. No real standouts. I enjoyed seeing the different artists' takes on the two-color palette. Beautifully drawn vignettes of magic and sci-fi. I was shocked by the quality and wish that each of the little stories were a fully fledged story because they were so fascinating! Hot damn, what a good anthology. A gorgeous anthology of fun, thoughtful, unique stories that will leave you smiling. A fantastic collection of diverse comics by diverse creators. More please! Taneka Stotts - Taneka Stotts is a queer little tumbleweed that stopped rolling somewhere in Portland, OR. After spending quite a few years as a spoken word artist, Taneka's focus shifted to comics, a medium full of collaboration and imagination. Taneka writes the webcomics "Full Circle" and "Love Circuits" as well as a creator-owned comic for Stela, "Deja Brew." Taneka has edited a few comics anthologies including most recently the award-winning "Beyond: The Queer Sci-Fi and Fantasy Comic Anthology" and "ELEMENTS: Fire" (Beyond Press). Taneka is currently working on "KINGMAKER!" with Mildred Louis.